One of the great joys of the digital photography is the ease with which our cameras reveal the world after dark. Scenes that are merely shadow and shape to the human eye are recorded with unseen color and detail by a digital sensor, and stars too faint to compete with moonlight shine brightly. 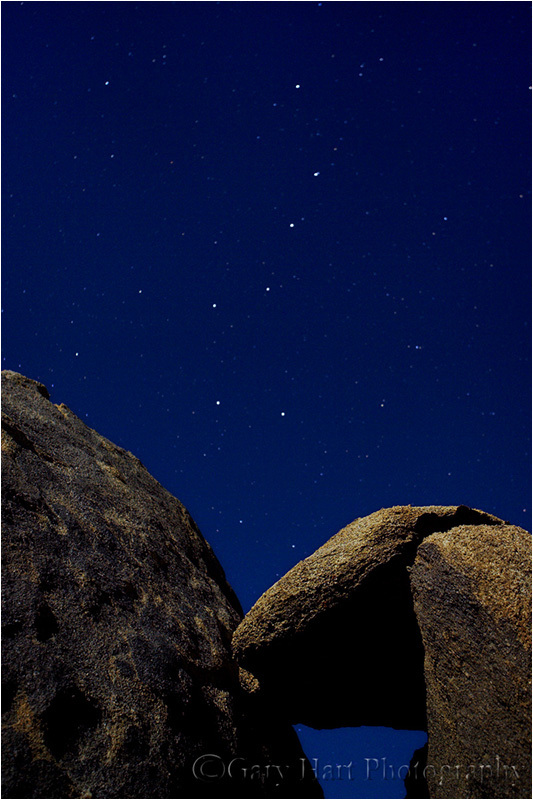 After a lifetime of refusing to sap my enjoyment of the night sky by attempting to photograph it with film, about ten years ago (a year or two into my personal digital photography renaissance) I decided to take my camera out after dark in the Alabama Hills to photograph Mt. Whitney and the sawtooth Sierra crest. It took just a few frames to realize that this was a new paradigm, but I wasn’t quite hooked until I viewed my images later that night and found, among a host of similarly forgettable Mt. Whitney among snow-capped peak images, one image of the Big Dipper framed by stacked, moonlit boulders that stood out. Ever since I’ve chased opportunities to photograph my favorite scenes after dark—first solely by the light of the full moon, and more recently (as digital sensors improve) by starlight. As I incorporate night photography into most of my workshops, I have no qualms about guaranteeing success for all my moonlight shoots (barring equipment failure). 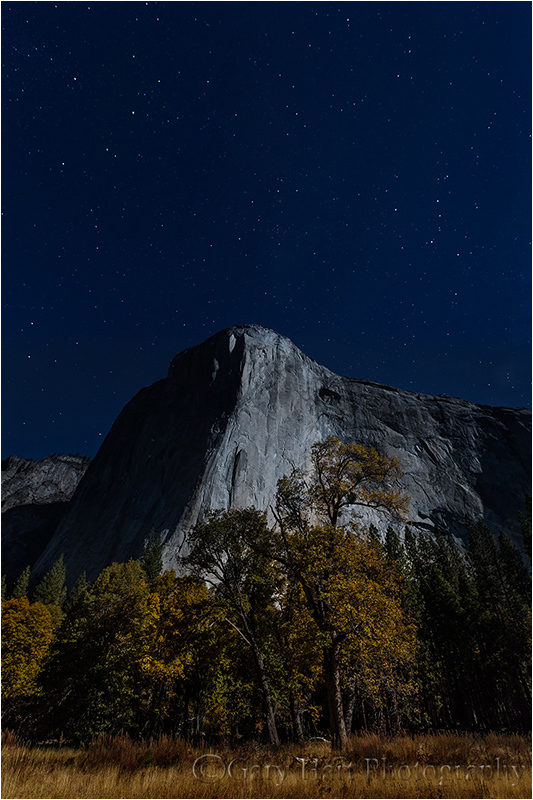 This month’s Yosemite Autumn Moon workshop was no exception—after photographing a beautiful full moon rising above Half Dome at sunset, we broke for dinner, then returned to the wide open spaces of El Capitan Meadow beneath El Capitan for a moonlight shoot. One of my favorite things about these moonlight shoots is the way everyone is equal parts surprised and delighted by how simple it is, not to mention how beautiful their images are. I’d spent time that afternoon getting the group up to speed on moonlight photography (it doesn’t take long), so after a brief refresher on the exposure settings and focus technique, everyone seemed to be managing just fine without me. Feeling just slightly unessential, I decided to try a few frames of my own. Struck immediately with how beautifully the autumn gold stood out, I shifted my position to align the most prominent tree with El Capitan. As with most of my night images, I went vertical to maximize the amount of sky in my frame. I also took care to compose wide enough to include Cassiopeia on the right side of the scene. If you have a digital SLR and a relatively sturdy tripod, you have everything you need for night photography. I have a couple of articles in my Photo Tips section to guide you: It’s best to start with moonlight photography before attempting the much more challenging starlight photography. Simply outstanding photographs, such captivating shots, well done! Gary your images inspire me, I’m always glad to see when an Eloquent Nature email shows up in my inbox. I was in Yosemite earlier this year and made several early morning images of El Capitan. I was amazed at how it was lit up by the moon. But the thing that captured my attention was the headlamps of the climbers already climbing at 430 in the morning! I’d rather be on the ground with you looking up! Keep up the good work. Thanks, Mark. I spend a lot of time working on my blog, so it’s always nice to know that it’s read an appreciated. And I’m totally with you on the climber thing—it’s pretty cool what they do, but I’m quite content to enjoy it with two feet on solid ground.